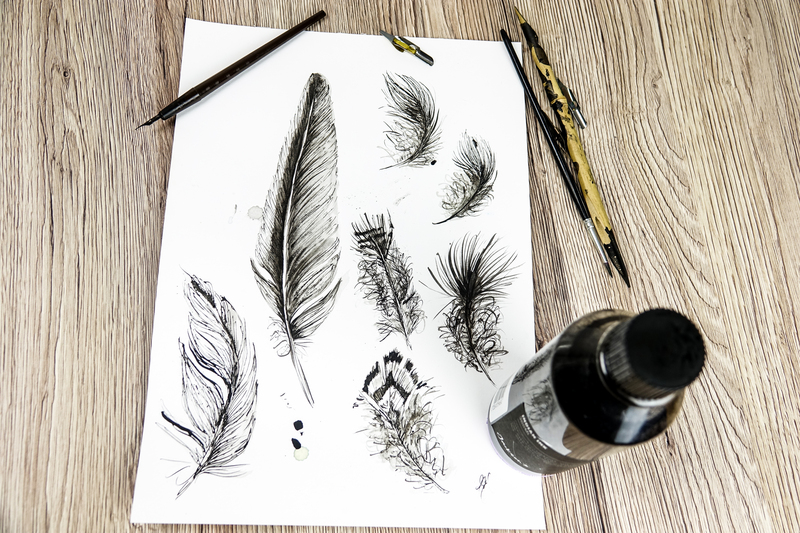 This Saturday I’m doing another feather drawing workshop . 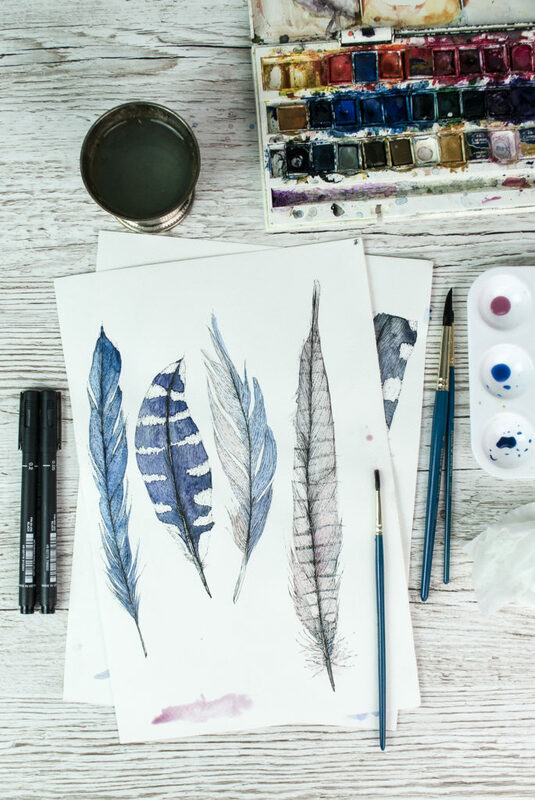 As I was prepping for it this weekend I wondered why I am so fascinated by feathers. 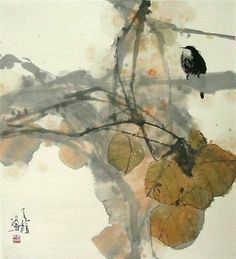 I suppose, for me, feathers represent duality. 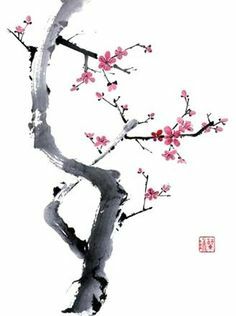 To me that are symbols of fragility and strength; the frailty of existence and yet the wonder of creation. 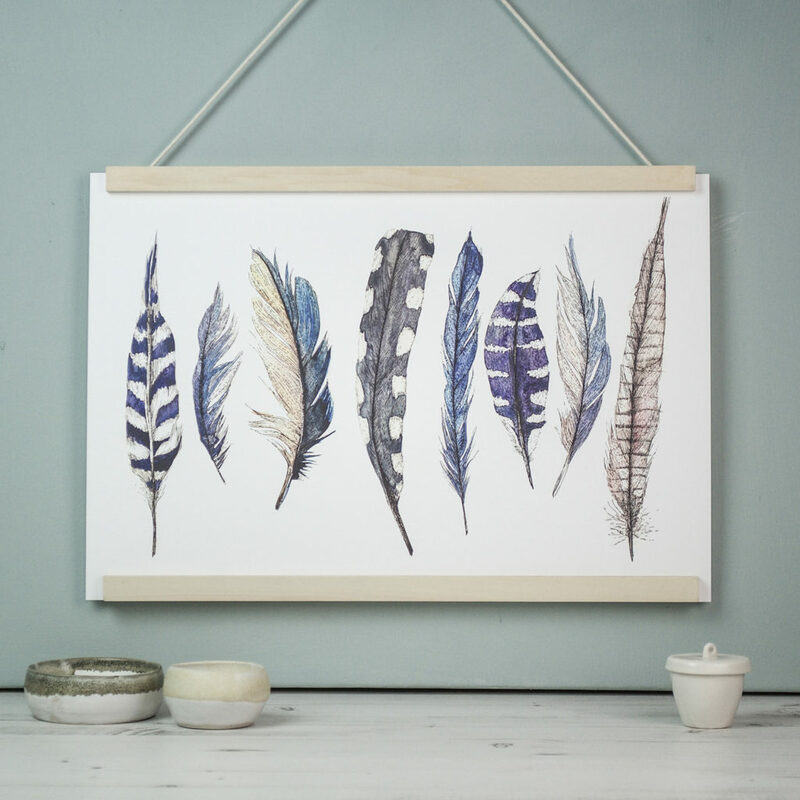 Hold a feather in your hand and it feels so light, almost weightless and soft. 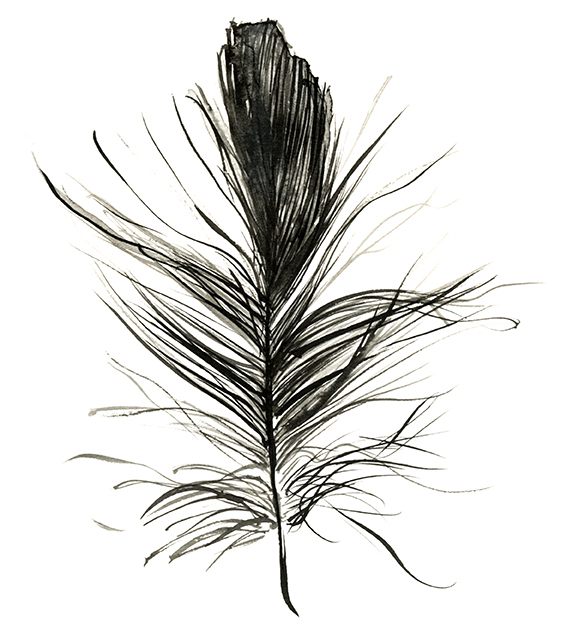 It’s so delicate that my instinct is to treat a feather with reverence and gentleness. However just look at even the tiniest of feathers’ structure and you see so much good structural design there. And strength, so much strength. 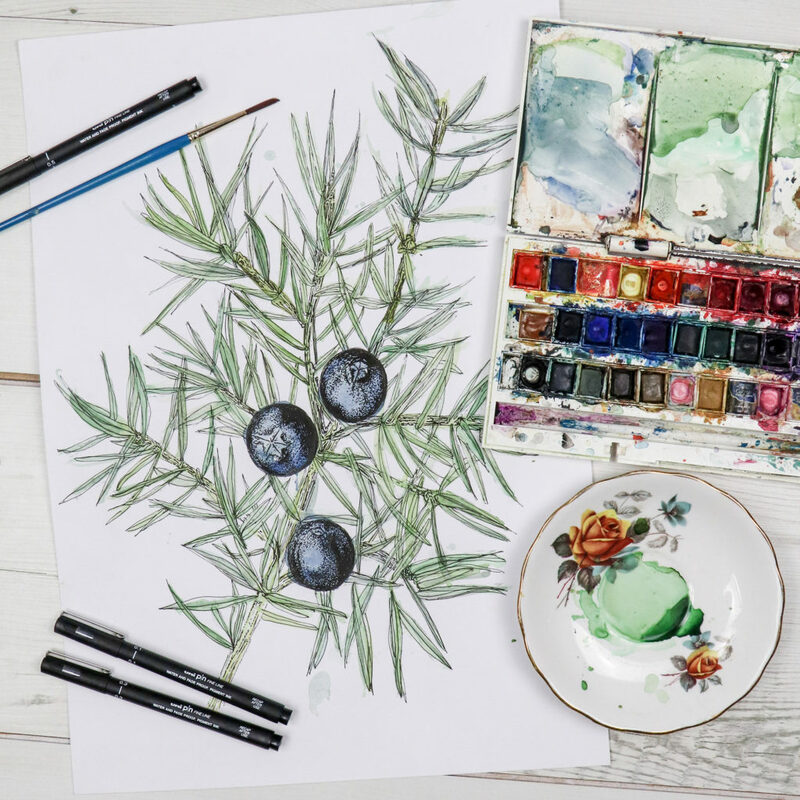 The process of observation and examination is fundamental to my art and illustration practice. The purpose of a feather – warmth, flight, waterproofing, camouflage, display etc – is so evident once you examine one close up. For me this one object symbolises so many of the things we need in life to survive both physically and emotionally; resilience, protection, comfort. As a species I feel we treat animal life so cheaply. We treat birds terribly. 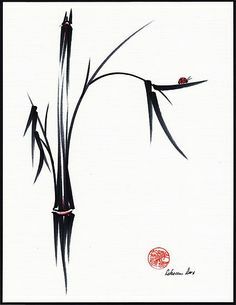 I also want the feathers to be a symbol of this. While they represent so much life, in reality they also are symbols of death. I like to represent them in my work as celebrations of life, proud and at times even totemic. 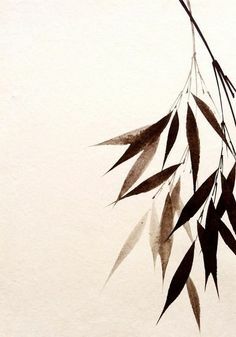 But as objects they are solitary, plucked, indeed, plucked or removed from a body. A stark reminder of the elemental, fragile line we walk between life and death. 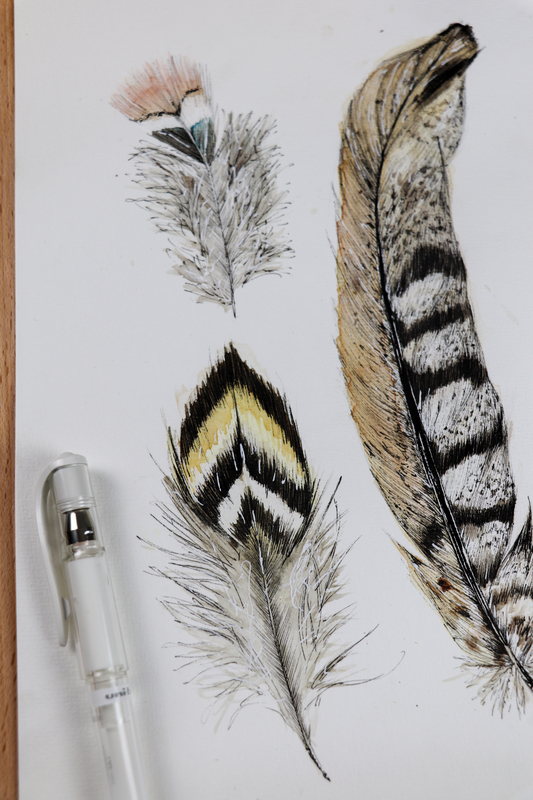 I must admit I’m conflicted when I have to source my feathers to draw. I’ve gathered a lot of them from the muddy floor of near-by woodland. I have been known to buy them from vintage markets (like when I use to buy leather jackets, I had to know the cow would have been long dead before I could benefit from it – a strange logic I know). But mostly I get given them by friends who find them on their travels. I’m also playing around with pen and loose Indian ink as you can see. Take a closer look at my feather prints on my Folksy shop. 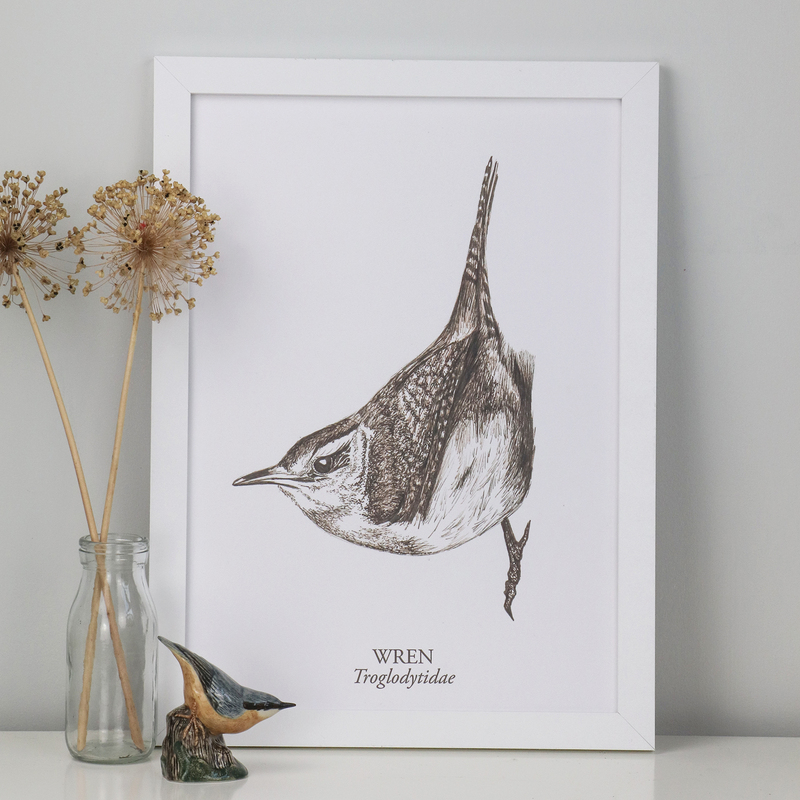 I’ve recently launched a whole new collection of illustrated bird prints now available on my Etsy and Folksy shops. 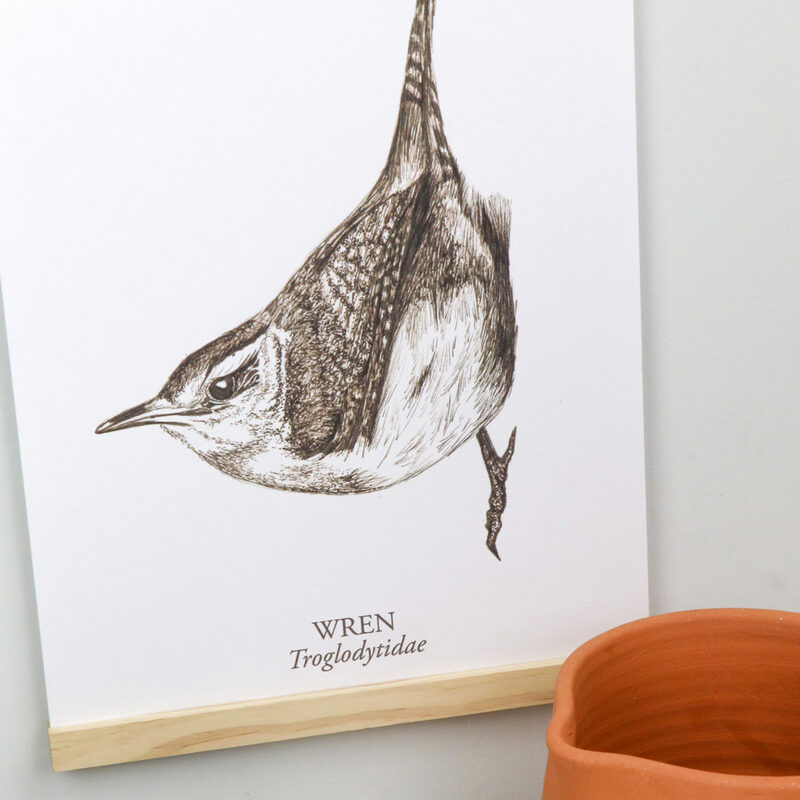 I really enjoyed drawing this wren – I created it using new uni-pin sepia pigment ink pens on watercolour paper. 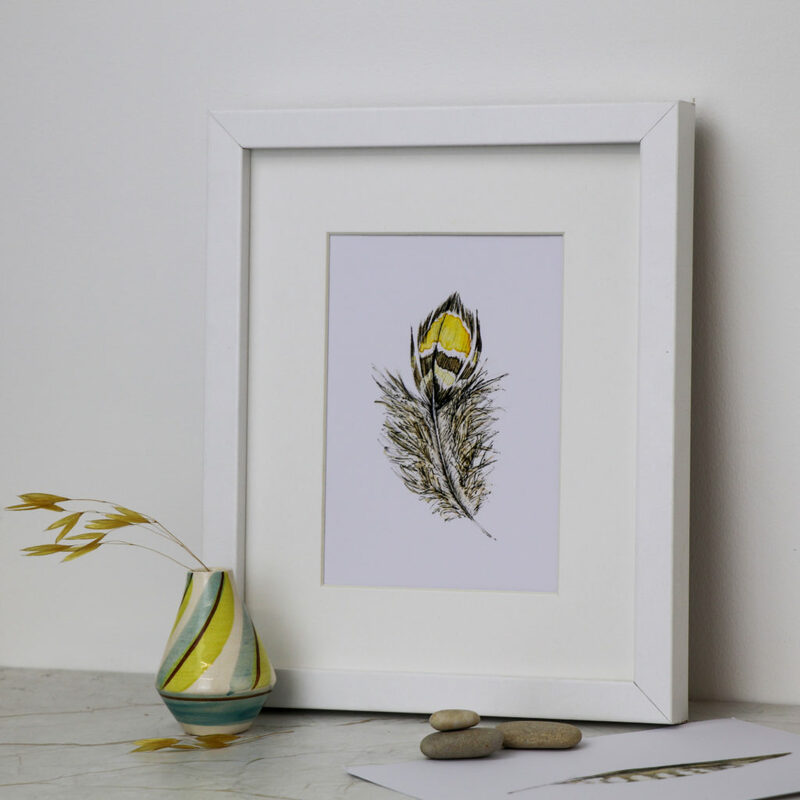 This delicate avian illustration is then scanned and printed as a fine art print on archival paper ensuring that it will last a lifetime. 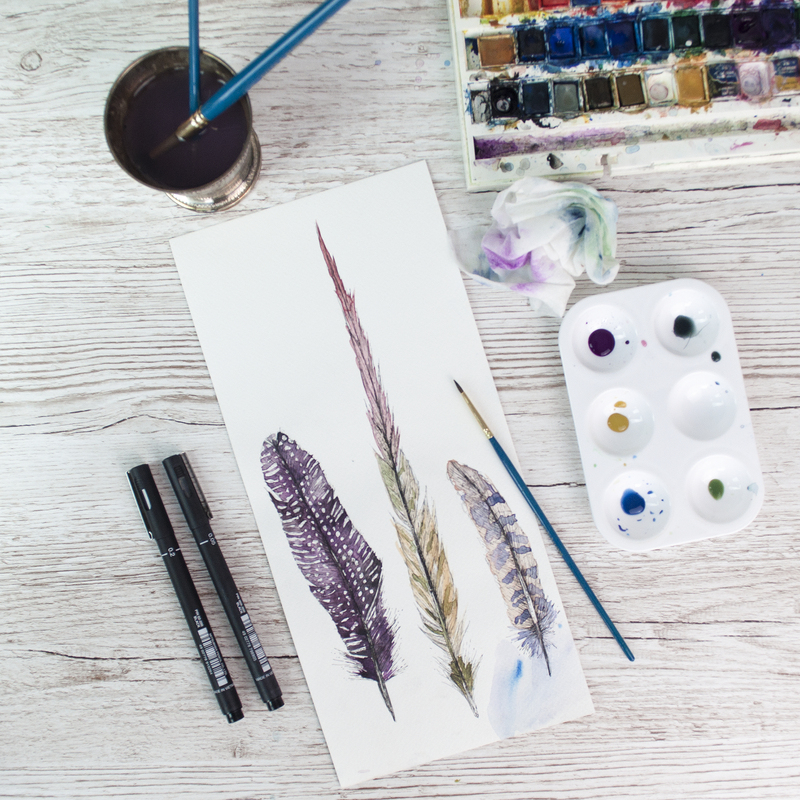 I originally created the watercolour and ink Peacock artwork for an exhibition. 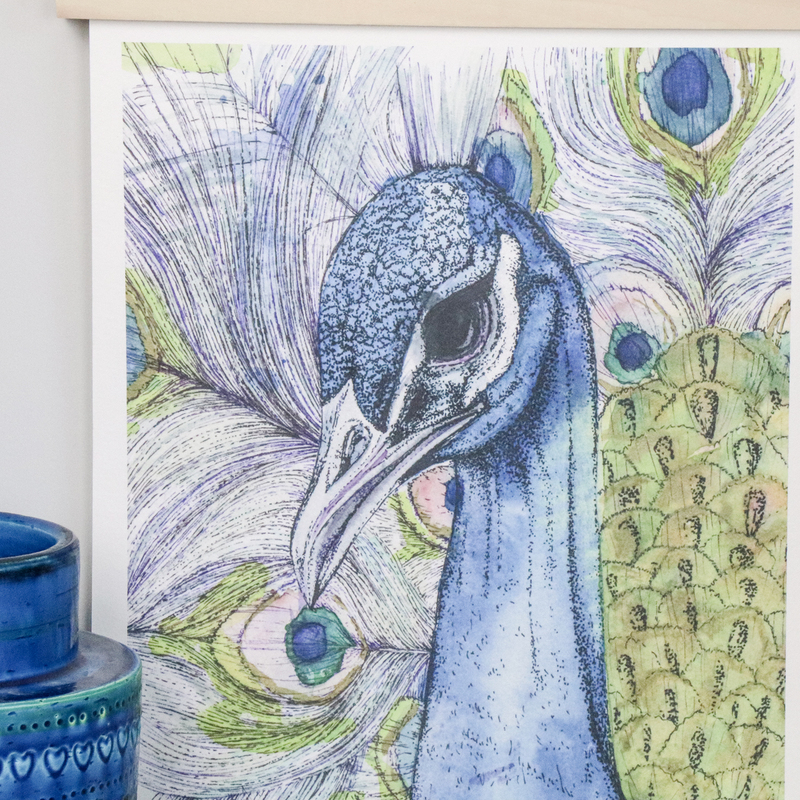 The artwork showcases vivid blue, pea green and violet watercolour washes combined with shimmery golden POSCA pen washes. I then overlaid the painting with pigment ink pen. 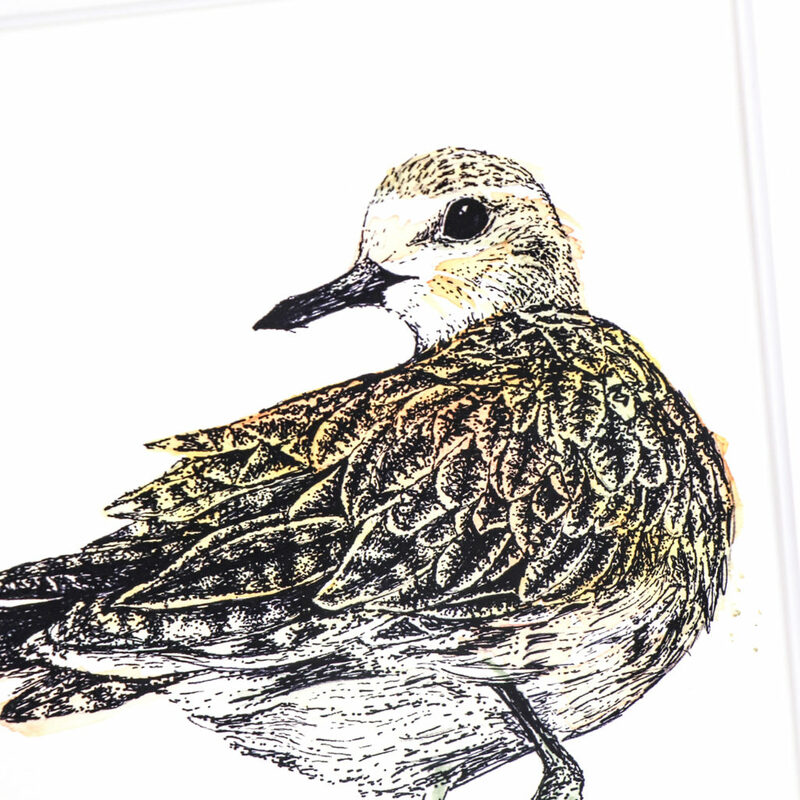 My golden plover drawing was originally created for the book The Migrant Waders, published by Dunlin Press. It was one of my favourite illustrations and I love looking at it, so I had to turn it into a print. Again this is printed on high quality archival paper so it will last a lifetime. 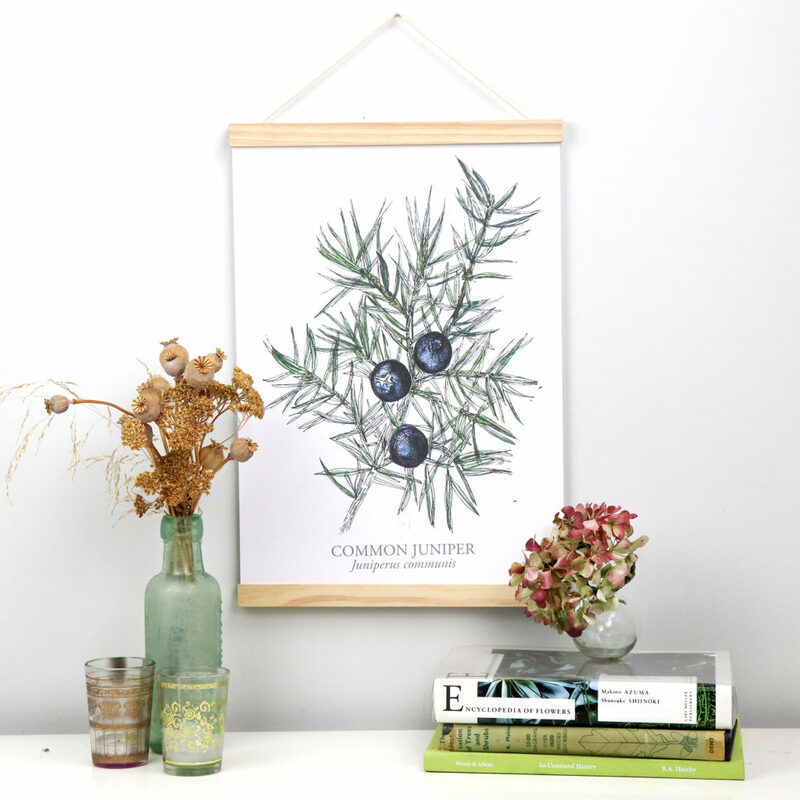 This is my new botanical print, juniper berries illustrated in watercolour and ink. 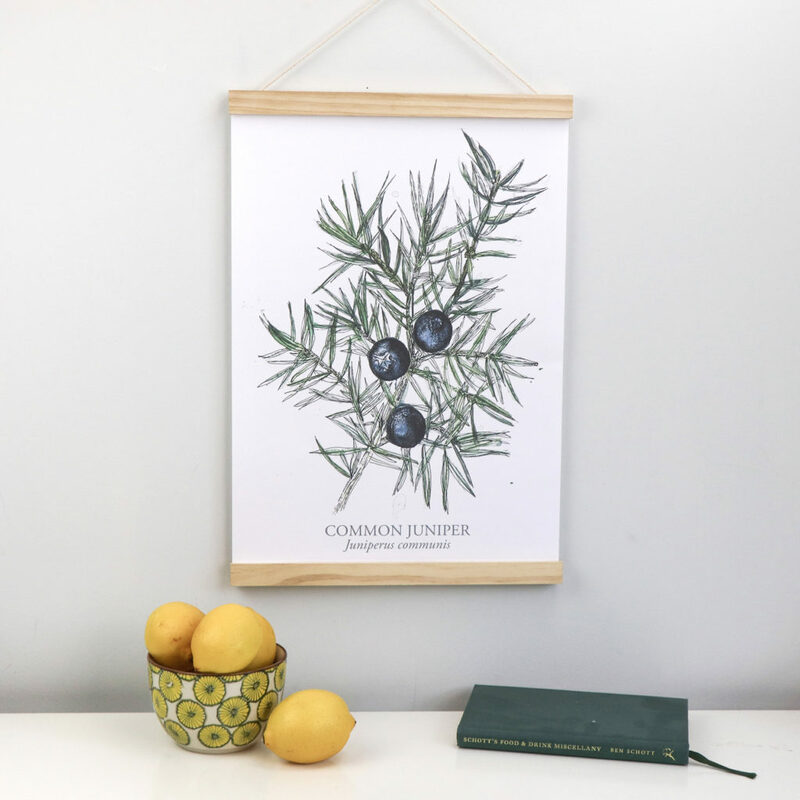 A perfect gift for gin fiends! I’ve been producing a lot of new work recently and I’m going to get into the habit showing some of it to you on a regular basis. 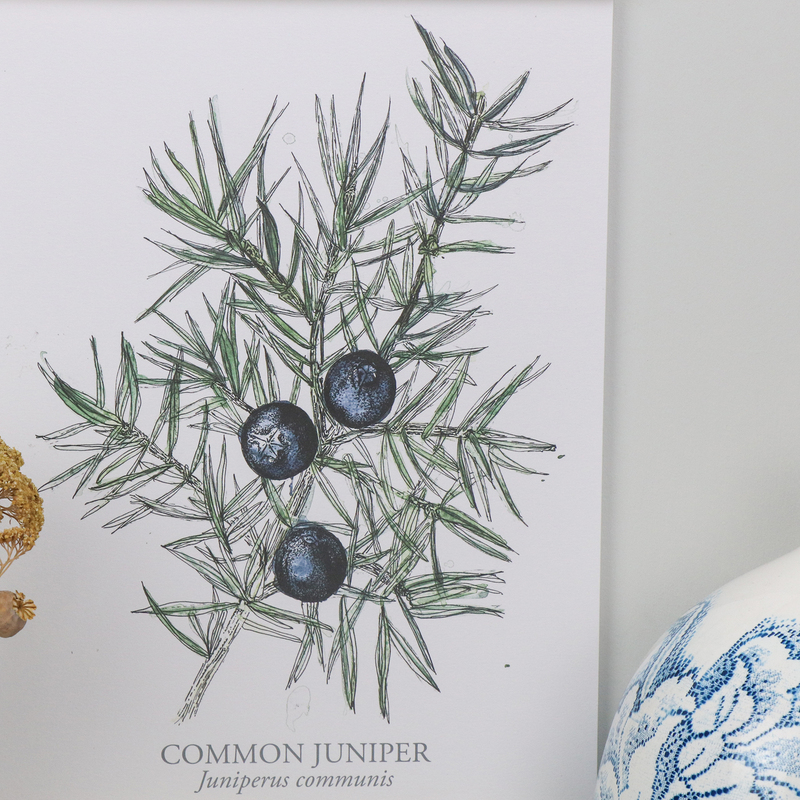 This juniper berries drawing was really fun to do – I love its needles (something I’m not too familiar with in terms of illustration) and its juicy berries. 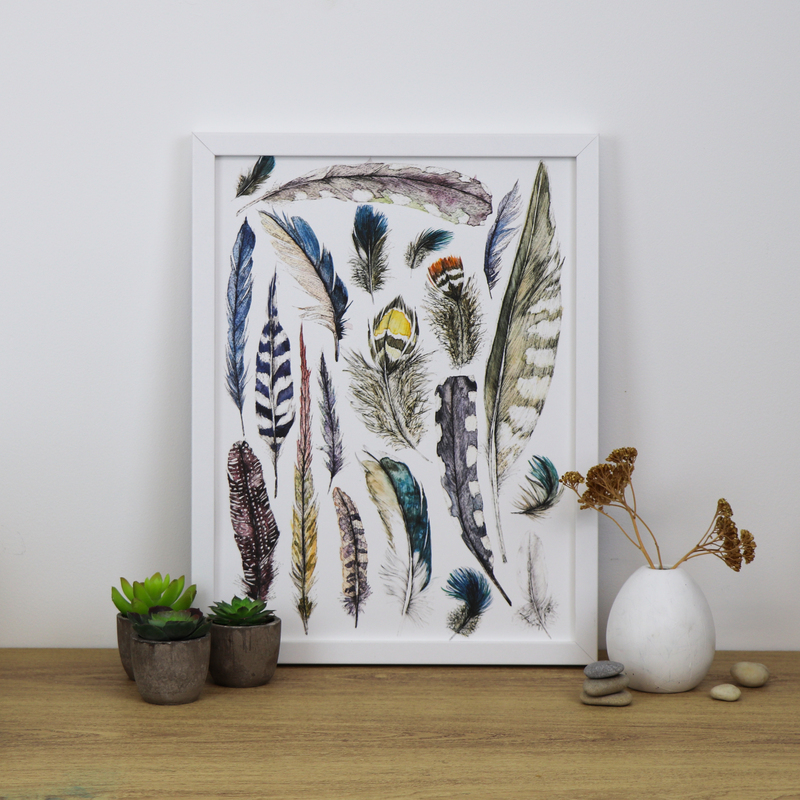 The new art print is available on my Etsy shop. 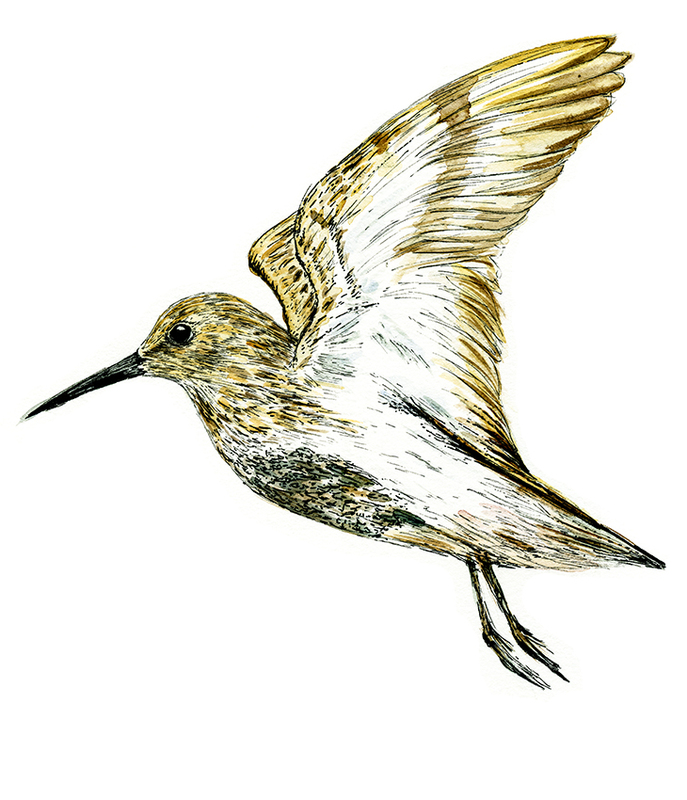 My October drawing of the month is of a flying dunlin. 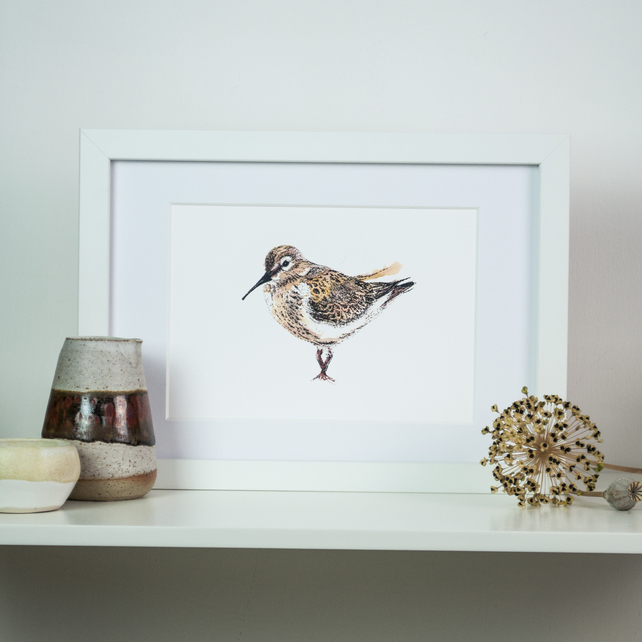 As the co-founder of Dunlin Press this bird is particularly important to me and Dr B. We are very fond of these birds, very soon they’ll be scuttling around in the mud on Wivenhoe quay. 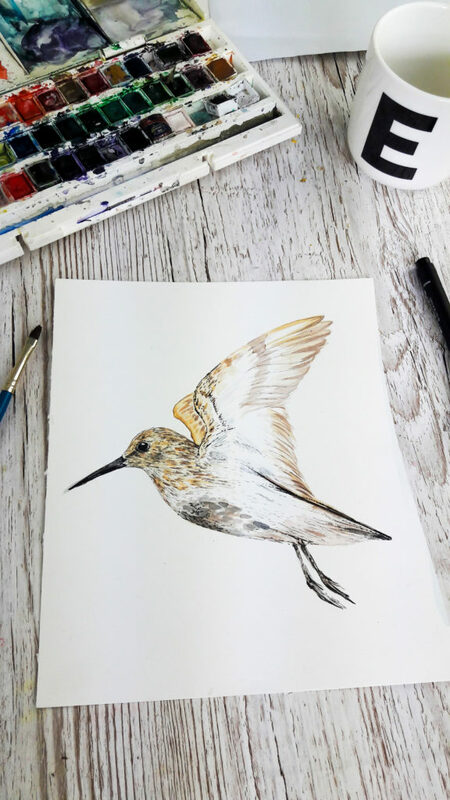 I’ve been drawing dunlins for a little while now, and even have a print of another dunlin drawing available on Folksy, but I’ve never attempted to draw a flying dunlin before. They are quite magical when they fly. 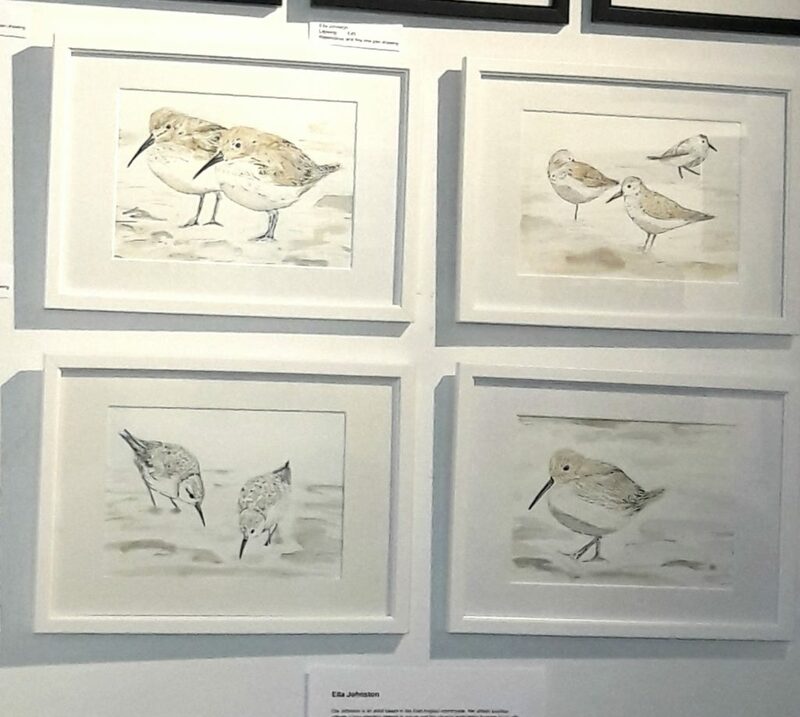 I normally spot these wading birds in groups scurrying around on the mud as the tide is coming in during twilight so it’s quite hard to see them at first. You can just about detect them by a little flash of white on their bellies. It’s only when they fly do you see them fully as the white plumage underneath their wings catches and twinkles in the moonlight, it’s lovely. 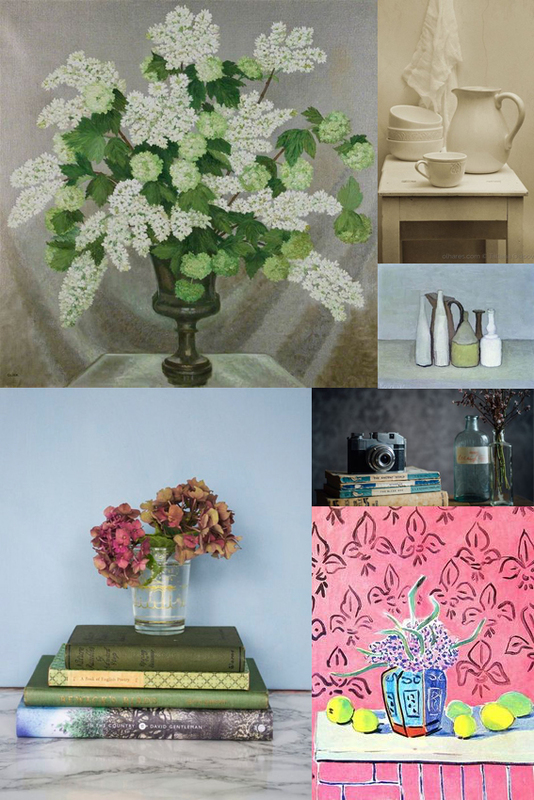 This month’s moodboard is dedicated to the still life. A couple of weeks ago I went to see the Matisse in The Studio exhibition at the Royal Academy. Ever since then I’ve been obsessed with still life painting and photography. 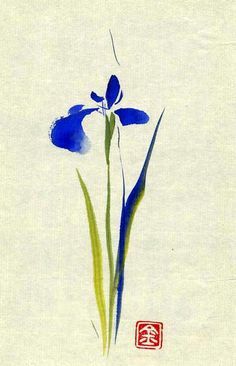 The exhibition explored the objects in Matisse’s home and how they manifested themselves in his work. Strangely I’ve never really considered doing still lives myself but the exhibition really got me thinking how the pieces we have in our homes hold such a personal place in our hearts. 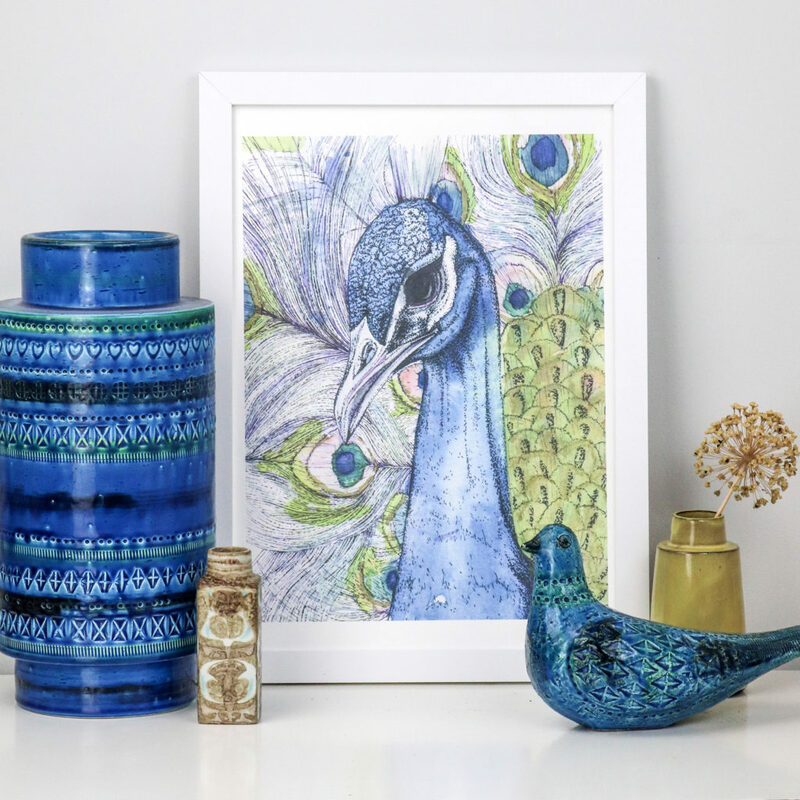 I genuinely don’t feel particularly materialistic but I admit that I have very deep attachments to certain vases, books and other objet so maybe recording them in my illustrative work would be an interesting process. It got me thinking about the concept of taste and what objects and arrangements I’d select to depict and the reasons why I’d do this. Also, in the world of Instagram I see so many people doing little tableaux on the channel as a way of representing their brand maybe the still life is the modern day portrait? Also I’ve included another great painting I’ve seen recently in the moodboard; Gluck’s Lilac and Gelder rose still life. I saw this at the Tate’s Quiet British Art show and I was blown away by its mastery and tenderness. On watching a documentary about the artist, it’s been said that Gluck’s work focused around whoever Gluck was having a relationship with at the time. 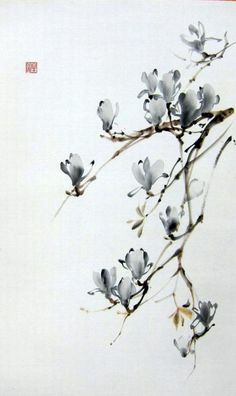 This was painted around the period where Gluck was having an affair with Constance Spry so there you. Again, it illustrates what a powerful medium for social and personal commentary the still life can be. 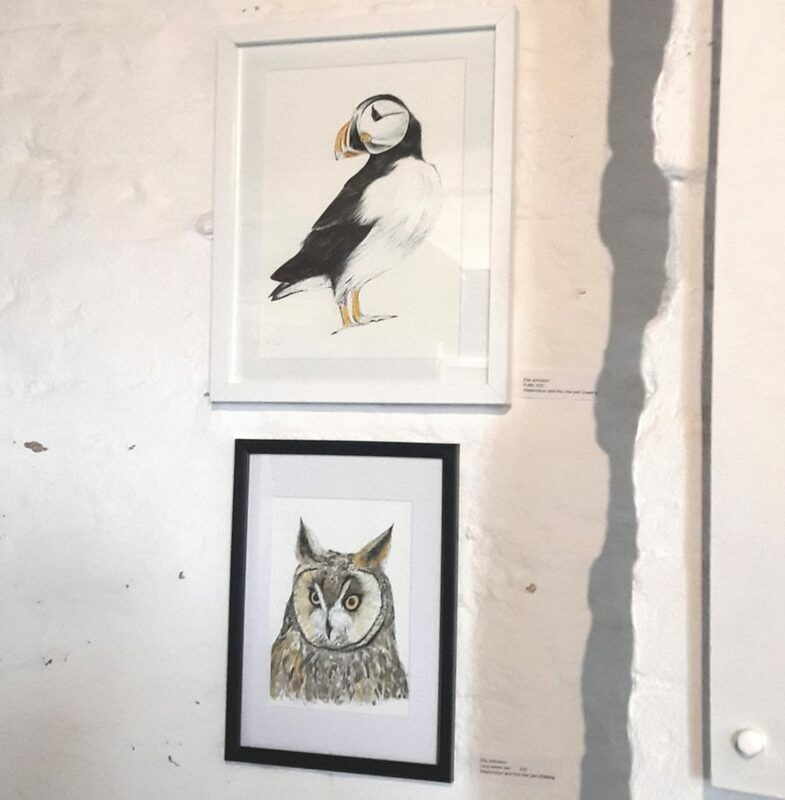 Watch this space for some watercolour and fine line still lives from me in the future. Forgive the use of an old picture (above) but I wanted to convey a bit of Ella at work action. This is one of me in our old London flat preparing for an exhibition. It’s the same story for every exhibition I’ve done – lots of cutting, trimming, framing and packaging! I was reminded of this when I prepared my work for the autumn/winter Naze Tower show. 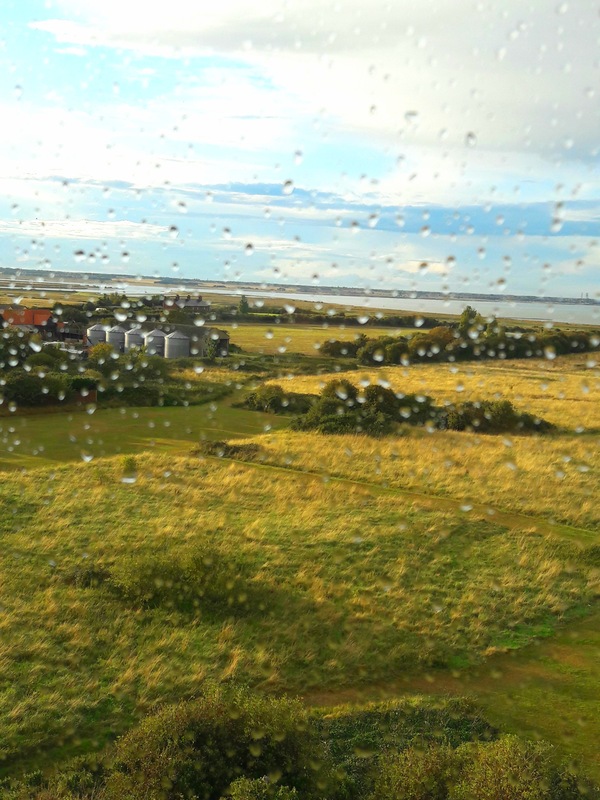 If you haven’t been to the Naze Tower and you are remotely local (it’s one and a half hours from London, half an hour from me in Wivenhoe) then I recommend a visit. Residing on an attractive stretch of coastline at Walton-on-the-Naze, the Naze Tower is an historic 86ft landmark and unique visitor attraction. Over eight floors it houses an art gallery with three exhibitions a year, a museum on the Tower and Naze, tea rooms and a roof viewing platform with spectacular panoramic views. 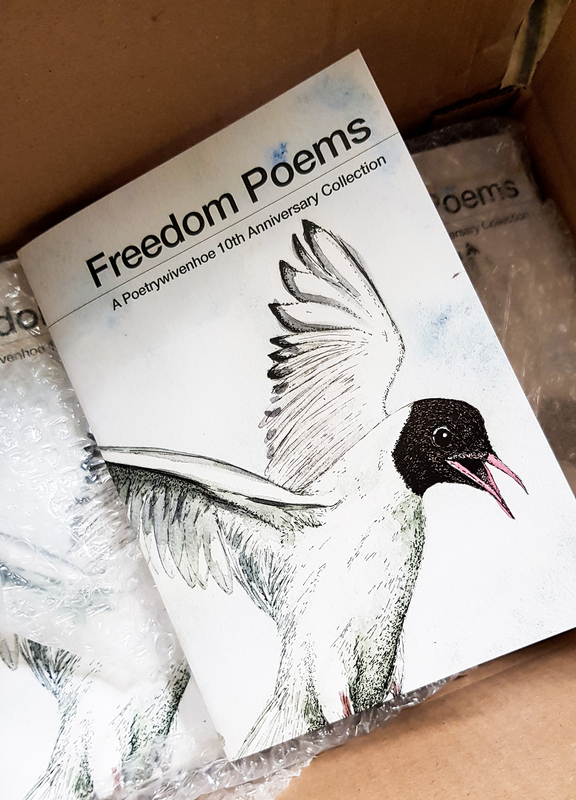 I recently illustrated the cover for an upcoming book Freedom Poems, published by Poetry Wivenhoe. 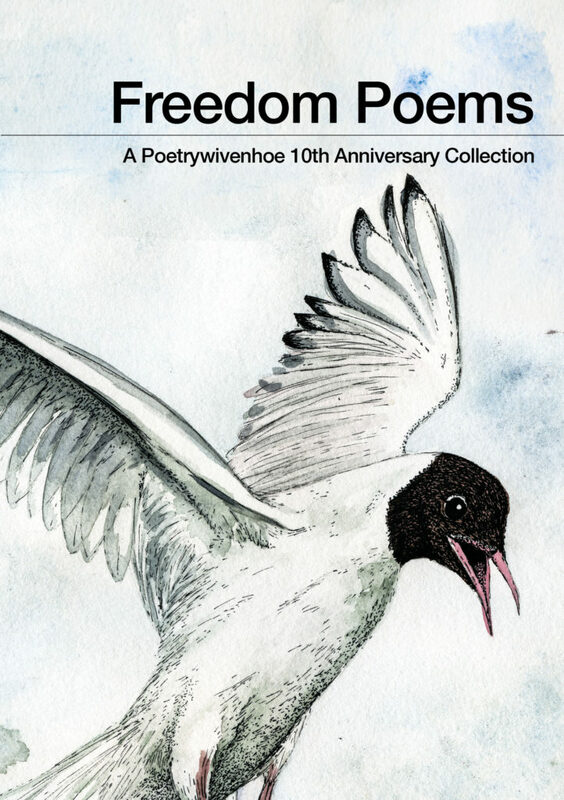 The drawing had to illustrate a sense of freedom while also illustrating the location of Poetry Wivenhoe. 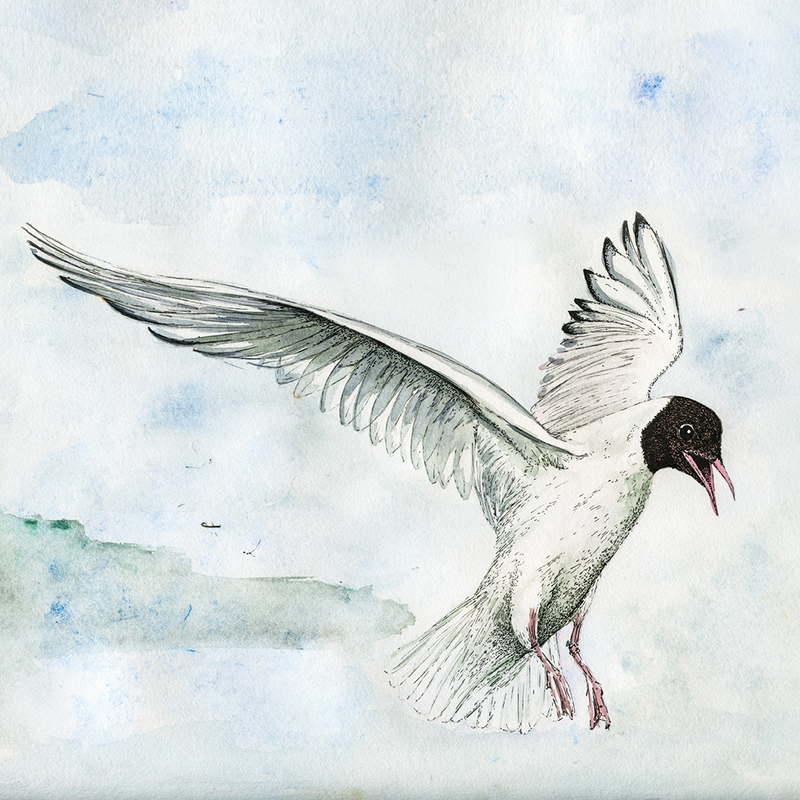 The black headed gull is very common in Wivenhoe so I chose a flying black headed gull as the motif. 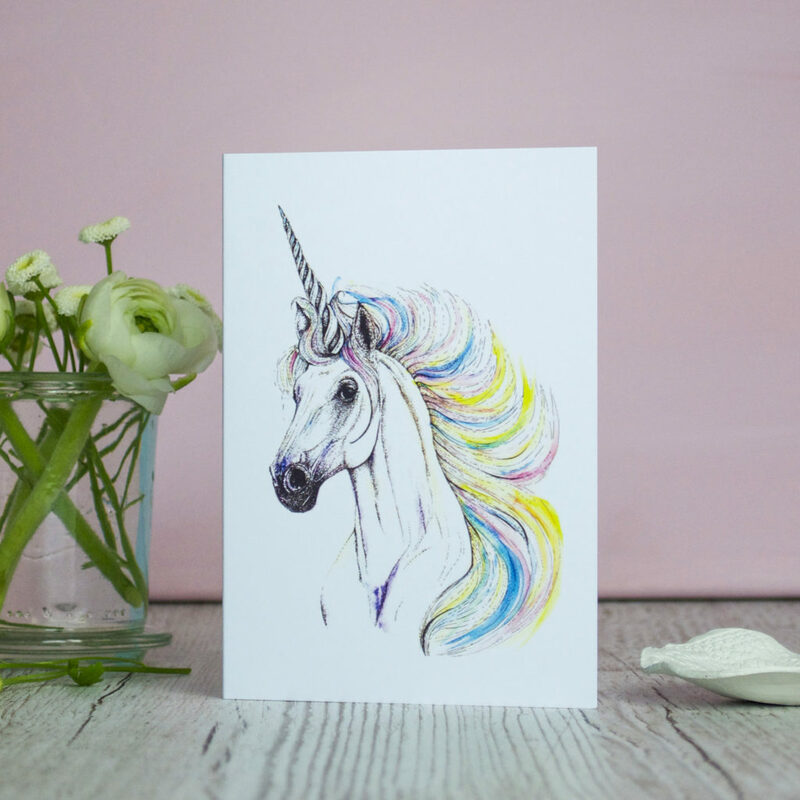 The illustration was created in watercolour and then overlaid with uni-pin pen. The book will be released on September 28th. 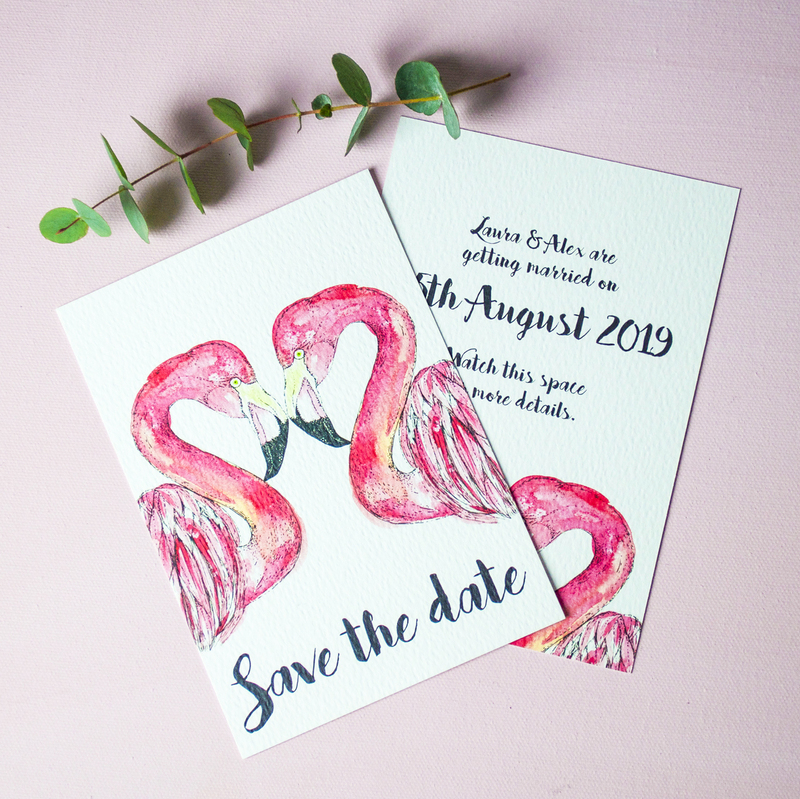 I can’t let National Stationery Week (#natstatweek) pass without a bit of blatant self promotion (sorry). So here’s the Ella Johnston stationery edit – all available on my Not On the High Street shop. 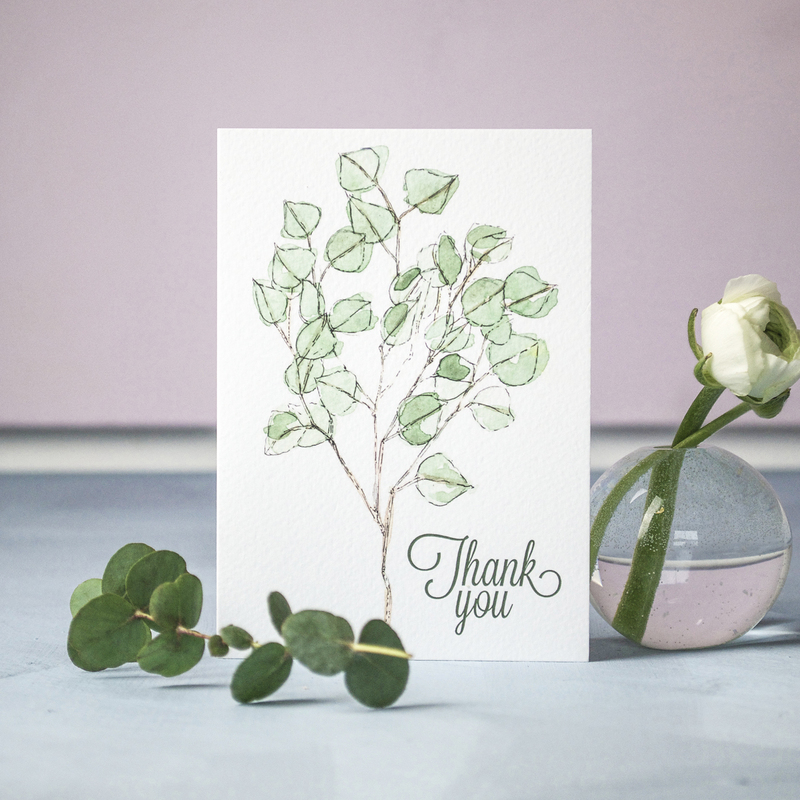 All the wedding stationery, correspondence and greeting card collections feature my hand-drawn illustrated motifs. 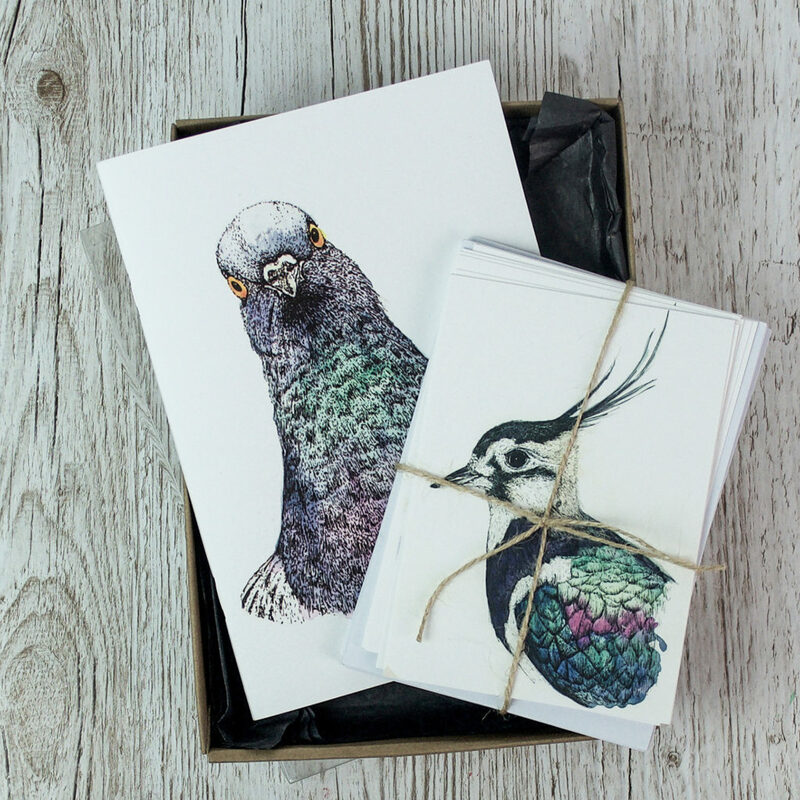 All illustrations (mostly birds and botanicals with the odd unicorn thrown in) are created in watercolour and fine line pen then they’re scanned, laid out with a finest fonts available to humanity and printed on beautiful FSC paper in the UK. Ella Johnston on Not On The High Street. 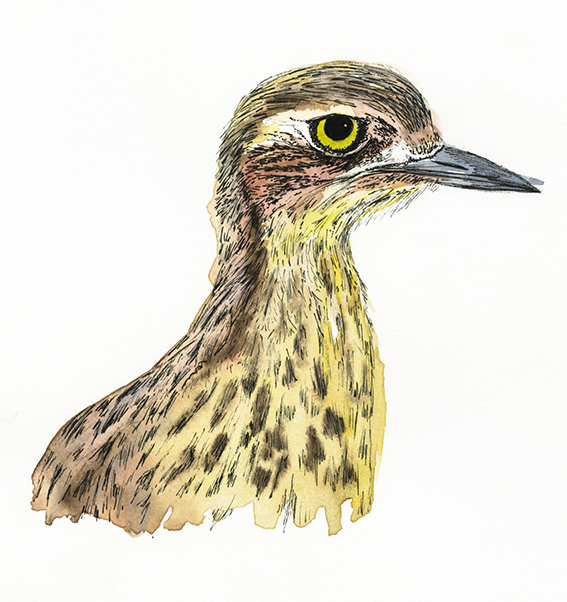 This stone curlew looks so grumpy I had to make him my drawing of the week. 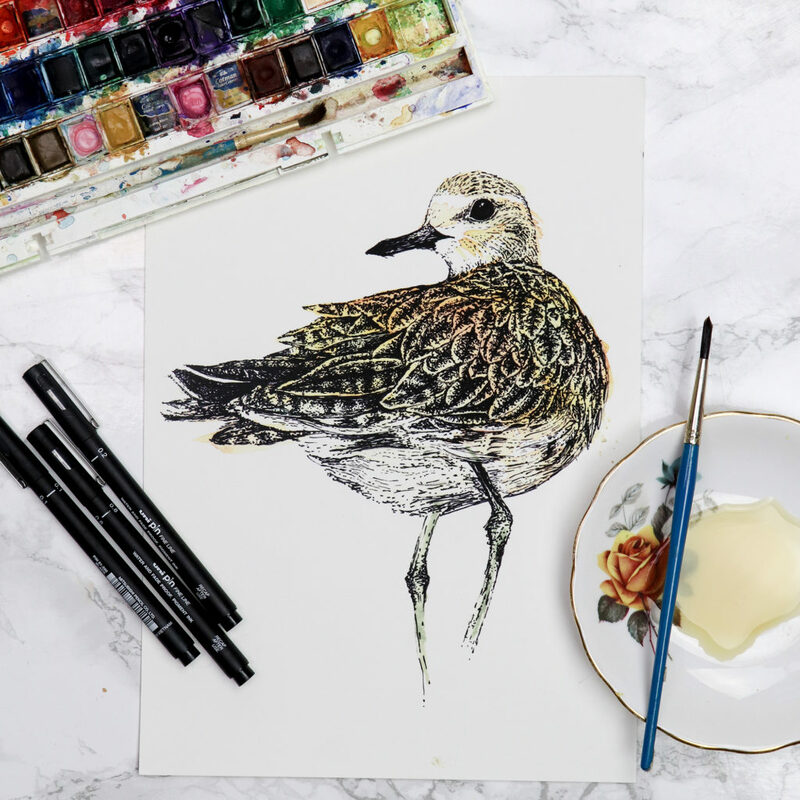 I became fascinated with Stone Curlews after watching Springwatch a few years back where one was brooding her chicks – I was rooting for the whole family. They are quite rare in the UK, visiting occasionally in areas such as Norfolk and Wiltshire. 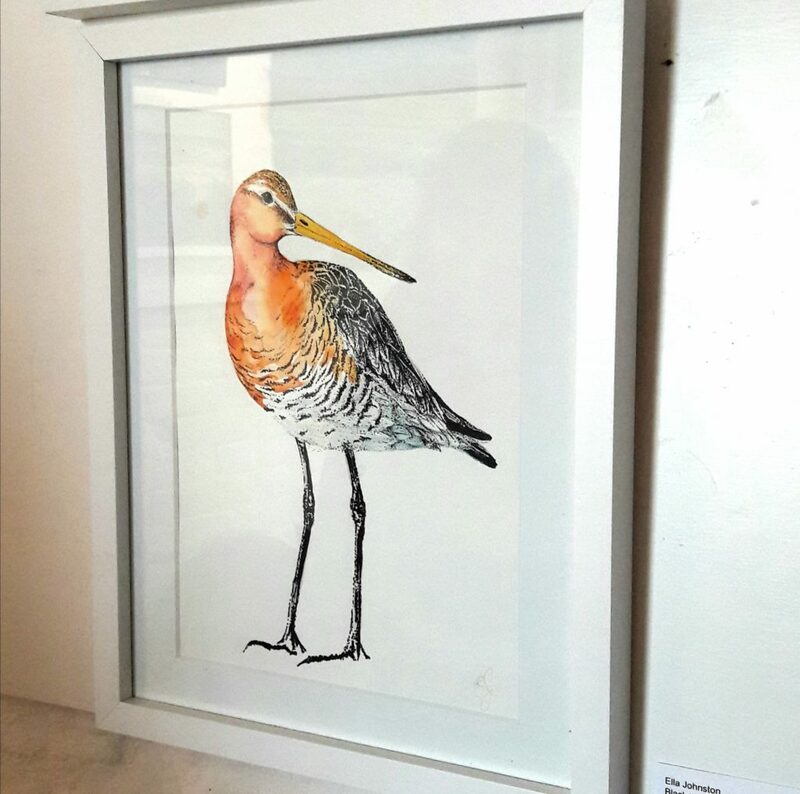 They are not related to our long-billed friends the curlew, but they do have a similar call hence the name. See that big yellow eye? That’s because this fella is mainly active at night and that peeper helps him see in the dark. 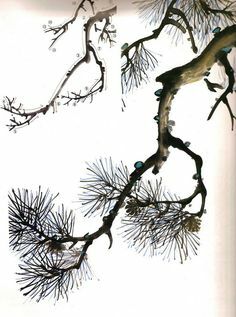 As usual I created this illustration using watercolour and ink with a combination of broad and fine tips to capture the variation in texture. 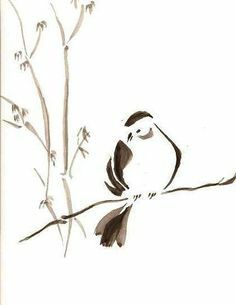 I wanted to keep the bird drawing quite scruffy, depicting him as if he’d just been discovered foraging among the rocks and stones. 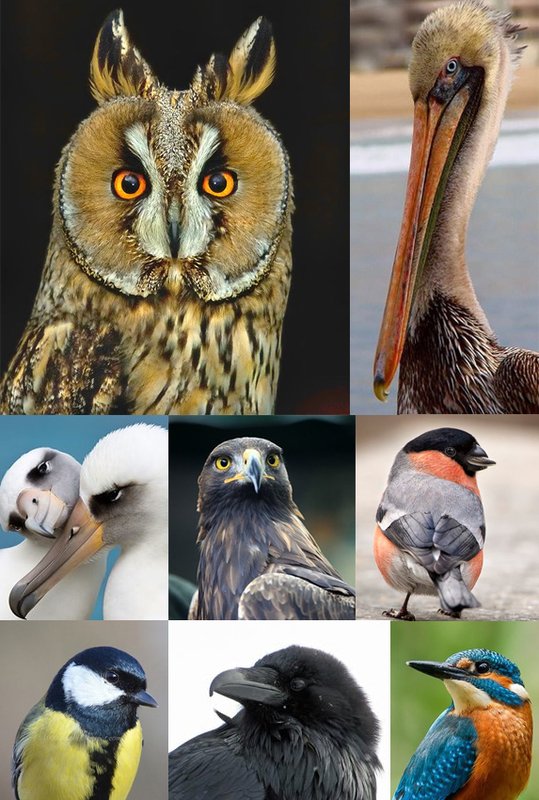 Well it was only a matter of time before I treated you a Monday Moodboard of birds. 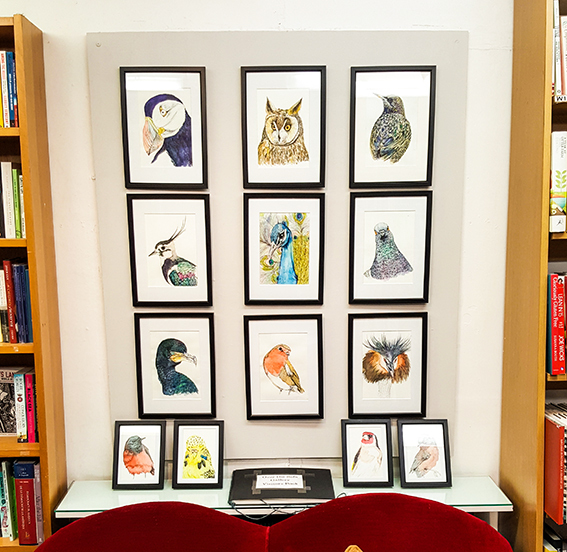 As you know an awful lot of my drawing practice centres around birds. 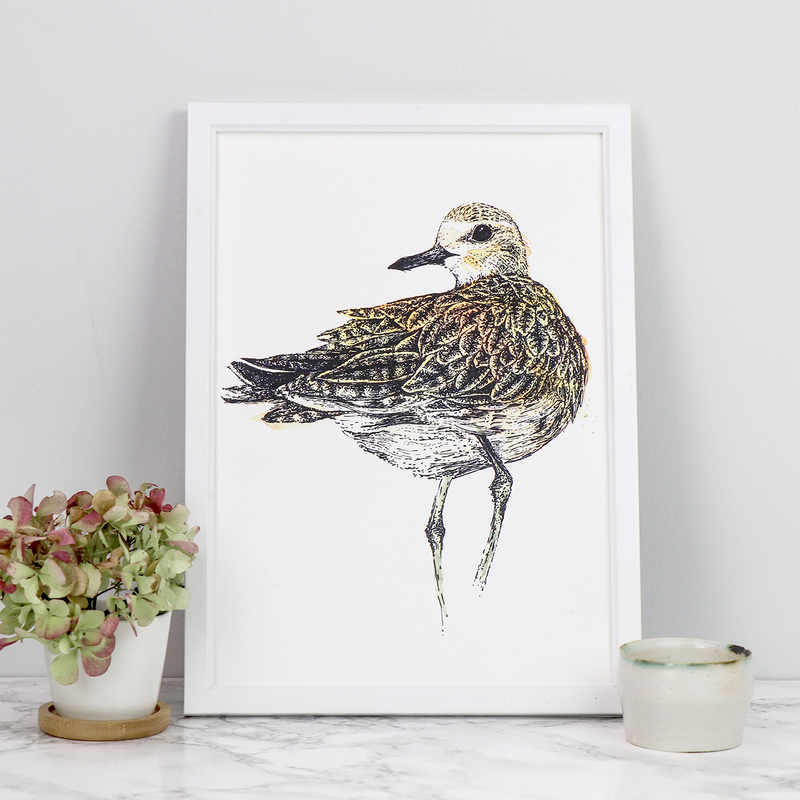 So much of my time is spent trawling and taking images of birds to study and illustrate. This is absolutely no hardship for me. I could honestly spend all my time looking at my feathered friends. 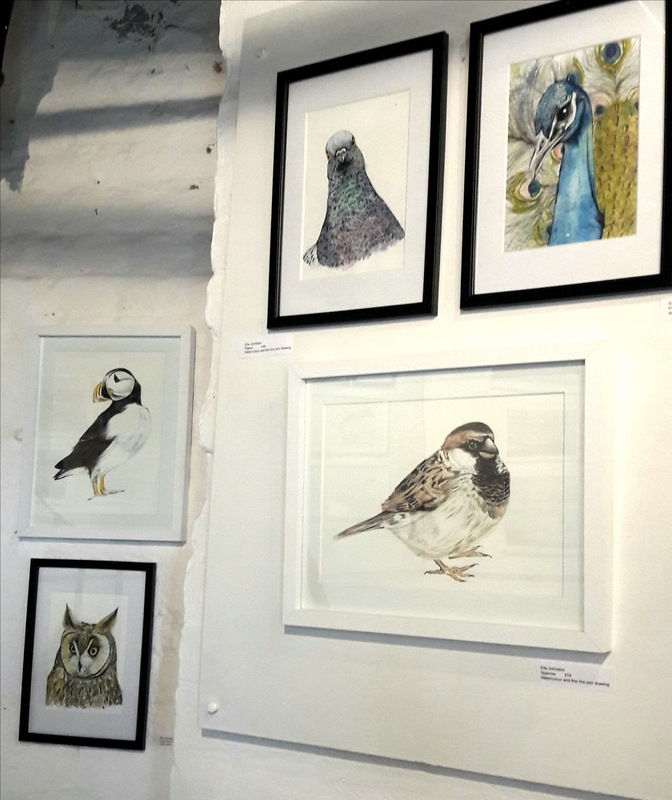 Recently I have been focussing on heads and shoulders to create bird portraits for my show at the Over The Sofa Gallery at Wivenhoe Bookshop. It’s a small space and I wanted to do it as a site specific piece, the show is called Family Portraits so it has a kind of homely feel. 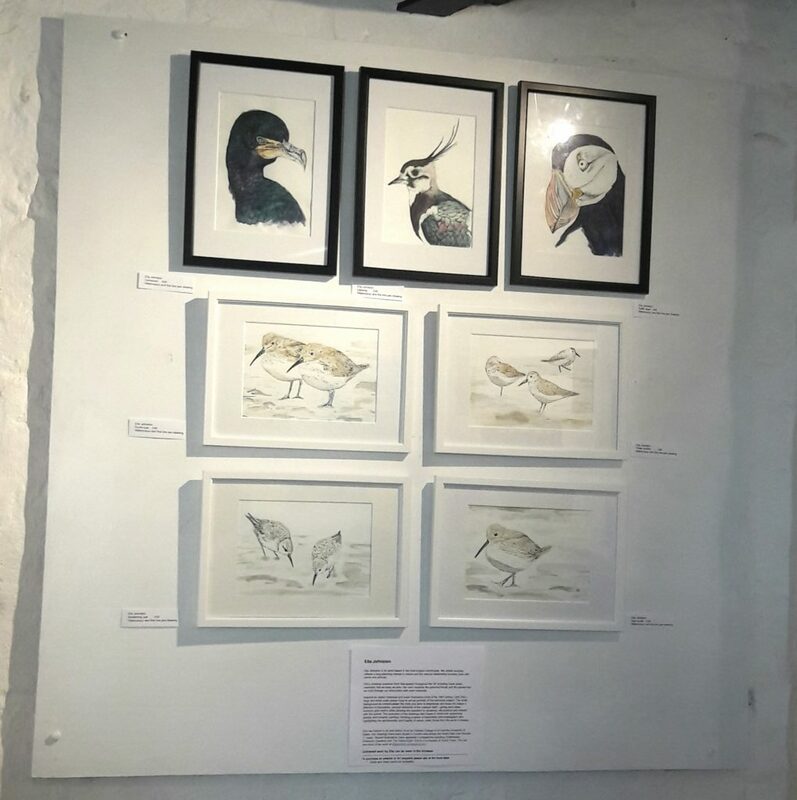 It consists of nine A6 watercolour and ink drawings and four A6 pieces. The show is on until April 30. On shelf: Black Redstart, Budgie, Goldfinch, Dartford Warbler.